What are risk factors for onchocerciasis? What are onchocerciasis symptoms and signs? Is there an incubation period for onchocerciasis? What types of specialists treat onchocerciasis? How do health-care professionals diagnose onchocerciasis? What is the treatment for onchocerciasis? Is it possible to prevent onchocerciasis? What is the prognosis and possible complications of onchocerciasis? Onchocerciasis is a parasitic disease that may cause blindness. It occurs mainly in sub-Saharan Africa and a few isolated areas in the Americas (Brazil, Colombia, Guatemala, Mexico, and Venezuela) and is transmitted by blackfly bites. It is called river blindness as the blackfly that transmits the disease lives and breeds near fast-flowing rivers. Symptoms include skin changes, itching, nodules, and alterations in vision. Symptoms may not appear for months to years. Onchocerciasis is diagnosed by finding the parasites in skin nodules, skin biopsies, or skin scrapings. The treatment is the antiparasite drug ivermectin, given once or twice a year for about 10-15 years; the antibiotic doxycycline may also be utilized. The major risk factor for onchocerciasis is residing or having extended visit time in areas where blackflies are endemic. There are no vaccines or drugs that prevent onchocerciasis. Avoiding areas where blackflies are endemic and the use of personal protection items (clothing, insect repellents) reduce the chance of infection. The earlier that onchocerciasis is diagnosed and treated, usually the better is the prognosis. 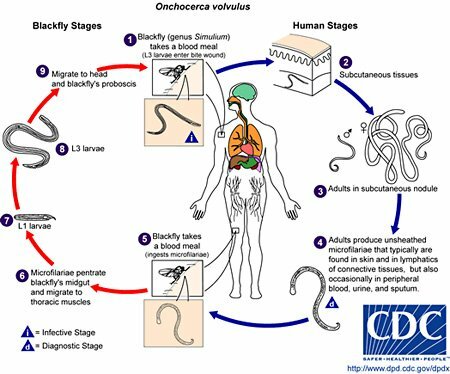 Onchocerciasis is a parasitic disease caused by parasites (nematode) named Onchocerca volvulus. It is transmitted to humans by the bite (blood meal) of the female blackfly (Simulium). The disease is also termed river blindness because the vector, the blackfly, is usually found breeding close to rapidly flowing streams and rivers, and because the most devastating manifestation of the infection is blindness. Although the majority of people infected reside in sub-Saharan Africa (for example, Nigeria), it also occurs in Central and South American countries and Yemen but much less frequently. After trachoma, it is the second-leading cause of infection-caused blindness worldwide. The CDC classifies it in the Neglected Tropical Diseases category: a group of parasitic and bacterial disease that cause substantial illness in more than 1 billion patients. The cause of onchocerciasis is the transfer of larvae of the parasite Onchocerca volvulus by the female blackfly when the fly gets a blood meal (bites) a human. The larvae enter the subcutaneous tissues and develop into adult male and female worms (filarial nematodes). These reproduce in the human tissue and form microfilariae that migrate to other areas of connective tissue and occasionally to the blood, urine, and sputum. In addition, both the adult worms and the microfilaria are colonized with bacteria termed Wolbachia that help these parasites survive. When the worms die, a host immune response ensues that can destroy optical tissue in the eye. The life cycle of the parasites is continued when a blackfly bites a human and, during its blood meal, ingests microfilariae. The complex life cycle is shown below. Living in and visiting sub-Sahara Africa and the few other areas where the blackfly is endemic is a major risk factor for developing onchocerciasis. The disease usually occurs after repeated exposures to blackfly bites so short-term travelers through these areas pose little risk; however, missionaries, volunteer health workers, and others who may spend a few months in the areas have an increased risk of infection. Onchocerciasis is not contagious person to person. 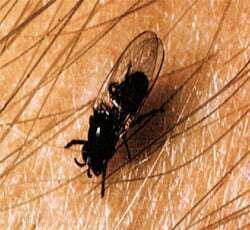 Transmission of the disease is through the bite of female blackflies (usually occurring during the daytime near rapidly flowing rivers and streams). Multiple bites are usually needed before being infected. "Sowda" is a term used to describe the severe itching and skin discoloration (darkening), that is often confined to one limb, that can be found with onchocerciasis. Although the infection with larvae begins immediately, the disease may not become apparent in an individual for months to years. In most individuals, it develops slowly in the skin although some patients may present initially with eye problems. Although local clinic doctors, who are often the patient's primary-care provider, usually treat onchocerciasis, specialists may be consulted. Such specialists are infectious-disease, ophthalmologist, dermatologists, and travel-medicine doctors. These specialists can help diagnose and treat patients with onchocerciasis. Clinical presumptive diagnosis is made if the patient lives or visits areas where the disease is endemic and has characteristic skin or eye changes described above. Definitive diagnosis is simply done by seeing adult worms in excised skin nodules, eye lesions, or by finding microfilariae in skin shavings or punch biopsies of the skin. In addition, an immunological test for antibodies developed against the parasites early in the infection is useful to determine if a person is infected before microfilariae are detectable. This test is available from the CDC. It is important to obtain a definitive diagnosis so that appropriate treatment can be started (see treatment section below). Onchocerciasis is a type of filariasis that does not respond well to some other drugs used to treat other similar filarial diseases. Diethylcarbamazine, a commonly used drug that is a derivative of piperazine, actually has been linked to severe and sometimes fatal patient reactions when used to treat onchocerciasis. Treatment is done by giving the patient ivermectin, an antiparasitic drug once or twice per year for about 10-15 years (the life span of adult worms). This antiparasite drug is effective in killing the microfilariae but does not kill the adult worms. The mature worms may remain alive for 10-15 years in the patient. Most clinicians recommend that subcutaneous nodules should be excised, if possible, thereby removing the adult worms that may reproduce more microfilariae over time. Some clinicians recommend that after ivermectin treatment, patients may benefit from a six-week dose of doxycycline antibiotic. Doxycycline damages and kills Wolbachia bacteria that are inside the microfilariae and adult worms, resulting in the death of microfilariae and ineffective microfilariae produced by the surviving adult worms. This may slow or halt further disease development. The use of diethylcarbamazine (a treatment used before ivermectin became available) is contraindicated. It may cause severe or fatal patient reactions in individuals with onchocerciasis. A new drug capable of killing the adult worms of onchocerciasis is under study for use in humans. It's named moxidectin but has not yet been approved for use in humans for treatment of onchocerciasis. The prognosis (outcome) depends on how quickly the infection is recognized and treated. The prognosis is good if the disease is adequately treated and the patient makes their follow-up appointments and treatments. However, if the diagnosis and treatment is accomplished late in the disease, the prognosis may be fair to poor because the patient may develop complications of significant skin alterations, visual problems, or complete blindness. United States. Centers for Disease Control and Prevention. "Parasites -- Onchocerciasis (also known as river blindness)." Aug. 10, 2015. <http://www.cdc.gov/parasites/onchocerciasis/>. United States. Centers for Disease Control and Prevention. Cantley, P. "Onchocerciasis (river blindness)." July 10, 2015. <http://wwwnc.cdc.gov/travel/yellowbook/2016/infectious-diseases-related-to-travel/onchocerciasis-river-blindness>.